PREBLE COUNTY — Girls track in Preble County this spring was dominated by Twin Valley South. The Lady Panthers won the Fred Durkle Invitational for the first time ever, won the Cross County Conference league meet, the Preble County meet, and won the Southwest Division III District Championship. The county also featured strong individual performances throughout the year. Eaton had a strong long distance running crew, North saw a freshman represent the program at the state meet, and Preble Shawnee and National Trail featured standout individuals in different events. Two girls qualified for the state tournament, Hailey Thies in the high jump and Madison Wright in the 800 meter. Both girls had tremendous seasons, however due to her success as an individual runner and being a member of a record breaking relay team, Madison Wright has been given the Preble County Runner/Athlete of the Year award for 2015 in girls track. Wright, a sophomore, finished 13th in the state in the 800 meter run, finishing with a time of 2:25.47. She finished third in the regional event with a time of 2:17.96 in order to qualify for the state meet. Wright competed in the 400 meter dash at the regional level after a third place finish in the event at the district finals. Wright was a member of the 4×800 team, which was conference champion and broke the school record multiple times throughout the season. The team missed qualifying for state by one position, despite its record time of 9:45.40. Wright was also a member of the 4×400 meter relay team which finished third in the district. Wright qualified for the regional meet in all four events she participated in at the district level. Wright was also Cross County Conference champion in the 400 and 800 meter runs. Thies joins Wright on first team. She finished 14th in the High Jump at the state meet as freshman after clearing 5 feet, but failing to clear the next jump. Thies cleared 5’4” in the regional for her personal best in order to qualify for the State Tournament but was unable to match the height at the state meet. Thies was district champion in the 100 meter hurdles and finished third in 300 hurdles to qualify for regionals. She was also the Cross County Conference champion in the high jump and 100 hurdles. Also on first team is Wright’s teammate Mylan Crews. Crews, a freshman, acted as Twin Valley South’s top sprinter this spring. Crews qualified for the regional event, where she placed fifth in the 100 meter dash, just over a second shy of qualifying for the state tournament. Crews was district runner-up in the 200 meter dash and third in the 100 meter dash, events she was Cross County Conference champion in. Crews also lead the 4×100 and 4×200 relay teams which finished second in the district. Abby Beneke, another Twin Valley South sophomore, is also a first-team member, after winning the Cross County Conference in the 300 hurdles. She also qualified for the regional event in the 100 hurdles after a third place finish at districts, and the 300 hurdles after a second place finish at the districts. She was a member of the 4×100 and 4×200 district runner-up relay teams. Both Beneke and Crews qualified for four events at the regional level based on their results at the district level. Abby Creech, another sophomore from Twin Valley South, is also on the first team. She was also a member of the 4×800 meter record-breaking relay team for the Panthers. Creech finished third at the district meet in the 800 meter run. Megan Wright, yet another sophomore from Twin Valley South, is also on the first team after a strong season running the 3200 and 1600 meter runs, where she finished second in the 1600 meter run at districts and third in the 3200. She was also a member of the 4×800 team. Senior Lyndsey Creech, another member of Twin Valley South’s record breaking 4×800 team, is also a first-team member. Creech helped her team in several events this spring, including helping two relay teams qualify for the regional meet as a member of both the 4×800 and 4×400 teams. Grace Stewart, a freshman from Twin Valley South, is the seventh member from Twin Valley South to be honored on this year’s All County First Team. Stewart was part of the district runner-up relay teams for the 4×100 and 4×200, as well as a member of the third-place district finisher 4×400 relay team. Elise Walker, a sophomore from Preble Shawnee, is a first team member after winning the SWBL and District Championship in high jump for the second year in a row. Walker missed qualifying for state this year by a single miss at the regional meet. 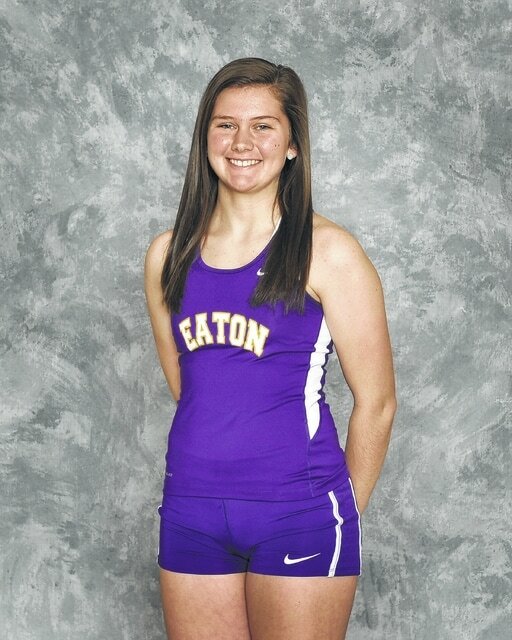 Taylor Broermann, a senior from Eaton, is a first team member after a strong spring in long distance. Broermann finished runner-up in the SWBL in the 3200 and 1600 meter runs. She missed advancing to the Division II state meet by one position, finishing fifth at the regional meet in the 1600 meter run. Broermann also competed at the regionals with the 4×800 relay team which finished 14th in the region. Sasha Taxter, a freshman for the Eagles who also competed on the 4×800 regional qualifying team, is a first team member. Taxter also ran in the open 800 and placed 12th in the region with a time of 2:30:33. She finished third at the district meet with a time of 2:27.86. Senior Morgan Evans of Eaton and freshman Katie Bassler are also members of the first team. Evans and Bassler scored points for the Eagles throughout the season, competing in the 4×800, 1600 meter run, 3200 meter run and the open 800 meter run. Rounding out the first team is thrower Madison Bowman from Eaton. The junior finished second at both the SWBL and district meets in the discus throw, while she finished fourth in the shot put at both meets. Honorable mention this year goes to Rachel Sibila, Natalie Hunt, Ruth Wellman and Hannah Wellman of National Trail; Adrianna Moore, McKenna Simpson and Sydney Hacker of Preble Shawnee; Josie Heck, Serena Singleton and Ashley Johnson of Tri-County North and Delany Adams of Twin Valley South.